Abscisic Acid: Entity of the Month | O'Really? Happy New Year from the ChEBI team where release 64 is now available, containing 534,142 total entities, of which 19,645 are annotated entities and 693 were submitted via the ChEBI submission tool. This month’s entity of the month is Abscisic acid. (+)-Abscisic acid (CHEBI:2365), known commonly just as abscisic acid or ABA, is a ubiquitous isoprenoid plant hormone which is synthesized in the methylerythritol phosphate (MEP) pathway (also known as the non-mevalonate pathway) by cleavage of C40 carotenoids. 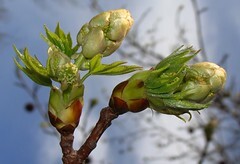 First identified and characterised in 1963 by Fredrick Addicott and his associates at the University of California, Davis , ABA was originally believed to play a major role in abscission of fruits (hence its early name of ‘abscisin II’). This is now known to be true for only a small number of plants, a wider role being to act as a regulator of plant responses to a variety of environmental stresses such as drought, extremes of temperatures, and high salinity. Such responses include stimulating the closure of stomata, inhibiting shoot growth while not affecting root growth, and inducing seeds to synthesise storage proteins. Because of its essential function in plant physiology, targeting the ABA signalling pathway holds considerable promise for future applications in agriculture. Now, in a recent issue of Nature, Ning Zheng and his co-worker Laura Sheard from the University of Washington summarise recent converging studies which reveal the details of how ABA transmits its message . In particular, an article by an international team led by Eric Xu of the Van Andel Research Institute describes how their crystallographic work on unbound ABA and ABA bound to some of its receptors, together with extensive biochemical studies from elsewhere, identify a conserved gate–latch–lock mechanism underlying ABA signalling .